There was a reason Henry David Thoreau implored us to “strike at the root” instead of “hacking at the branches of evil.” If you're faced with a difficult social problem that affects the lives of many, such as the problems Thoreau pondered so eloquently in Walden and Civil Disobedience, then the only way to solve the problem is to strike at the root. This page will try to explain how you can do that. This will not be easy because striking at the root is a new paradigm. It's a new way of thinking and working. It's long been used in science and business, but has never been taken up by environmentalism. This page and this website is an effort to change that. Three main tools as shown. This is the heart of the approach. The tools work together to solve difficult social problems in a manner completely different from environmentalism's present approach. Click on "a difficult social problem" or a tool to learn more about it. An in-depth first iteration analysis that was driven by the tools. This illustrates how the tools can be applied and offers many reusable insights and conclusions, particularly the root causes and high leverage points. Twelve sample solution elements based on analysis results. These differ radically from popular solutions because each solution element is designed to resolve a specific root cause. The approach is designed to help you and your organization more efficiently achieve your goals. A systematic analytical approach like this is not for everyone. It requires serious study to learn and apply. But it requires a lot less effort to master than fields like surgery, particle physics, chemistry, finance, and law. That’s because the approach was designed from the start to be simple enough for any dedicated problem solver to master, but flexible and powerful enough to solve any difficult social problem if conscientiously applied. The approach looks complicated at first, but once understood it's as simple as learning how to make a fine French soufflé. Second, it is violently opposed. Third, it is accepted as self-evident. The graph below shows how well environmentalism is doing on solving the sustainability problem. 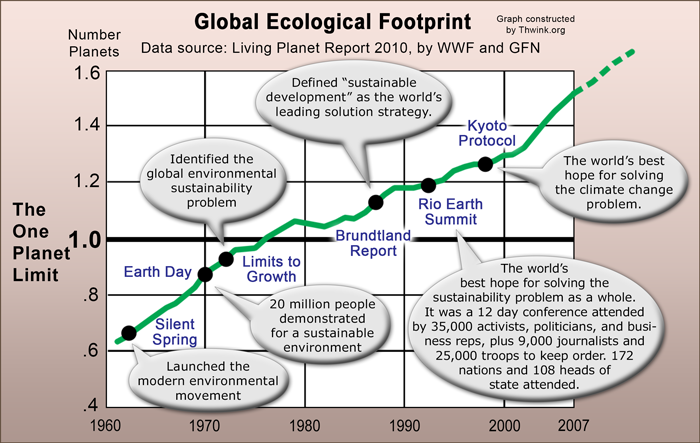 Growth in the global ecological footprint crossed the limit of what one planet can provide in the 1970s. Ever since then the human system has been living in overshoot, now at about 50% and climbing. Unless the problem is solved soon, severe consequences are unavoidable. This is clear evidence the environmental movement is not doing too well. Solution efforts like the six dots on the graph have had little effect. Our central problem is nowhere close to solution. This is normal for new fields. They always have trouble solving their central problems at first. But eventually, with concerted effort and lots of trial and error, the genesis of a new approach that works begins to emerge. Thomas Kuhn calls this the move from Prescience to Normal Science. It’s a move all fields make when they’re born. Once a field has moved to the Normal Science stage it’s capable of solving its initial fundamental problems. 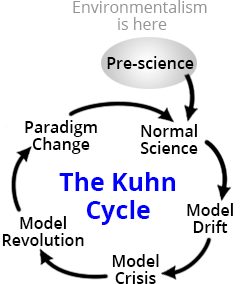 After that the field travels through the steps of the Kuhn Cycle. Environmentalism finds itself in its Prescience stage now. The field desperately wants to solve its central problem of sustainability, but it doesn’t quite yet have the tools it needs to develop the models of understanding required to solve such a difficult problem. Neither did chemistry when it was in its Prescience stage of alchemy. Neither did medicine with it was in its Prescience stage of bleeding, purging, poultices, baths, rubs, and incantations. The present paradigm of environmentalism is Classic Activism. It’s a simple problem solving process based on traditional approaches to public interest activism. Classic Activism has worked on problems like slavery, women’s suffrage, and civil rights. But it hasn’t worked on the sustainability problem because the process doesn’t fit that problem. Prescience is where environmentalism is now. Even the definition of sustainability is endlessly contentious, as is debate over fundamental solution strategies and goals. Every field must take this step if it is to solve its central problems. Chemistry took this step when it discovered the general pattern of how different elements behaved and why, and put it all together in the Periodic Table of the Elements. Medicine moved from Prescience to Normal Science when it developed a model of understanding of why disease occurred. It was mostly due to infection. The sustainability problem can be solved, once environmentalists move from Prescience to Normal Science. They will have moved from Classic Activism to Analytical Activism. It's a move from an old to a new paradigm. It's a move from a traditional approach of no real analysis of the problem as a whole to an approach driven by methodical analysis of the causal chain present in all problems. This is a bit of work. But it allows you to take your ax and swing it and strike at the root of your problem, with an excellent chance of hitting your target. All problems and phenomenon arise from their underlying causes. Once you’ve built a model of understanding of a problem’s causes you can solve the problem or, as in the case of fundamental scientific research, explain why a phenomenon occurs. This is the universal approach to how fields solve their central problems. Members of a field work together to develop a shared model of understanding, like the theory of infection or the modern evolutionary synthesis. Once a field has its basic tools they can be applied by any of the field’s practitioners. This is what Sir Isaac Newton provided when he discovered the three laws of motion and the law of universal gravitation. These were the universal causes of why moving bodies behaved the way they did. Once these causes were understood, anyone could solve problems like planetary motion, why the tides occur, and how long it will take an apple to fall. 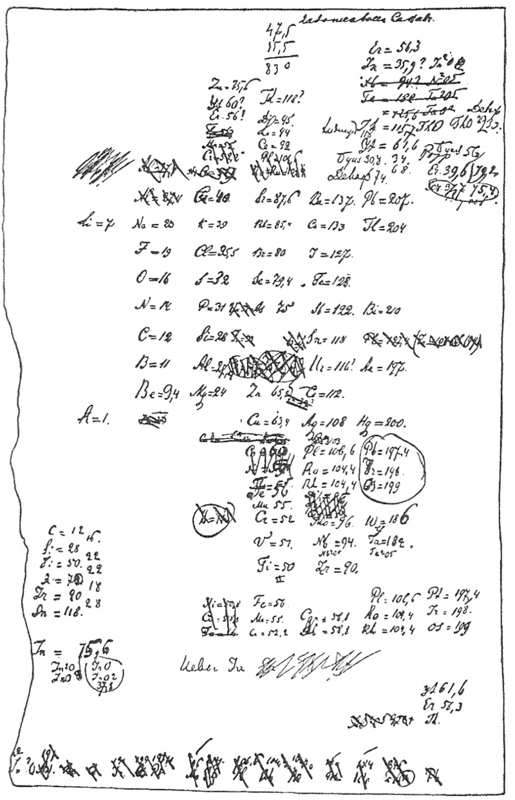 This is what Dmitri Mendeleev provided when he invented the Periodic Table. It was so productive it correctly predicted discovery of eight new elements. 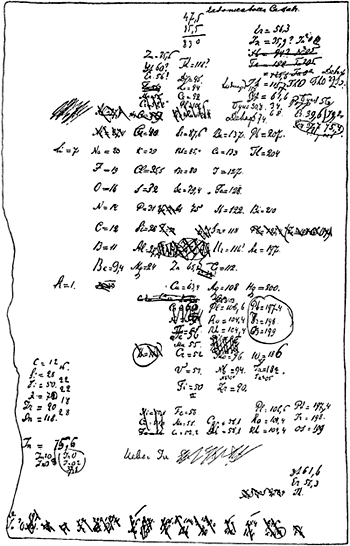 Shown is a copy of a very early draft. This is a rare case of the capturing of the birth of a new paradigm. Our approach takes these four steps as its starting point. Our central strategy, really our central vision, is that Analytical Activism is possible. It's possible to find and resolve the underlying causes of any difficult social problem, if of course the problem is solvable. How to do that can be packaged into a learnable format that can make us all analytical activists, just as other fields have done with their core knowledge. We strongly feel the sustainability problem is solvable. It’s no more difficult that past historic problems like the Cold War, the autocratic ruler problem (solved by invention of democracy), the recurring wars in Europe problem (solved by creation of the European Union), and the Malthusian Trap (solved by the Industrial Revolution, which plucked humanity out of the trap of low carrying capacity, which had long caused human life spans to be short and not that pleasant). the better the process used to solve it must be. 1. Observe a phenomenon that has no good explanation. 3. Design an experiment(s) to test the hypothesis. 5. Accept, reject, or modify	the hypothesis. A process is a repeatable series of steps and practices for achieving a goal. This is so crucial to the success of any field that due to lack of a foundational process, all of science was held back until the 15th century, when the work of Francis Bacon, Rene Descartes, Galileo Galilei, and Sir Isaac Newton established the Scientific Method. After that everything changed. Science moved from Prescience to Normal Science overnight. Soon there was no stopping the ability of science to explain previously inexplicable phenomenon and to solve problem after problem. The end result was the Industrial Revolution, which has taken the modern world to where it is today. The more difficult the problem, the harder it is to find the causes. That’s why a process that fits the problem is mandatory. For this reason science invented the Scientific Method, business invented the process of double entry accounting, and modern medicine invented the process of systematic diagnosis and testing of treatments. All we’ve changed is four words. 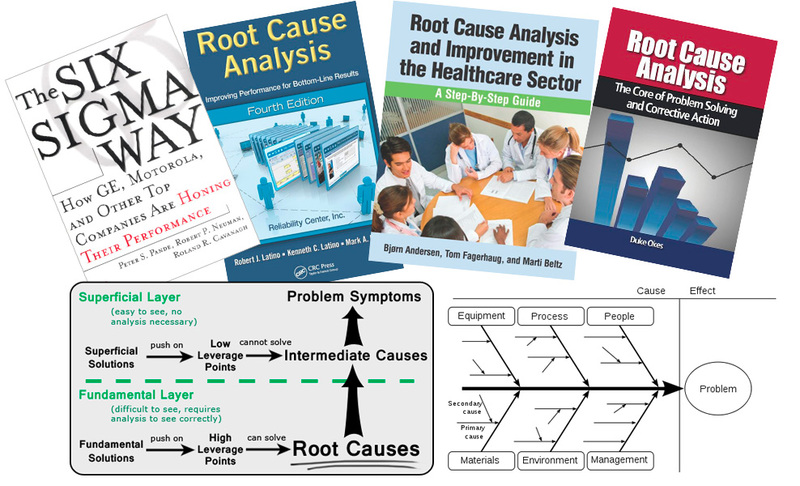 “Study” becomes “analyze.” “Causes” becomes “root causes” in two places. “Fix” is now “resolve.” That’s all it takes at the high level to create a problem solving process that fits the sustainability problem. It’s essentially a root cause analysis driven process. At the low level there’s plenty more. But that’s a matter of detail. The important thing is that if environmental organizations can apply the System Improvement Process (or any suitable root cause analysis approach) they can at last solve their central problems, just as so many other fields have. At that point we have transformed ourselves from classic to analytical activists, and jumped from Prescience to Normal Science, where problem solving success is the norm. 1. Faster time to solution, due to getting it right the first time by focusing on root causes and high leverage points. 2. Lower cost of solution, since resolving root causes is much more efficient than attempting to resolve intermediate causes and because solutions that work become so much easier to find. 3. Increased solution reliability. This is the natural consequence of resolving root causes with solutions that work instead of attempting to resolve intermediate causes with superficial solutions that work temporarily, partially, or not at all. 4. Higher acceptance of your work. The job of selling your research proposals to funders and your solutions to institutions, including government, becomes much easier. This occurs because you can prove a solution set (or research proposal) has a high probability of working since it resolves clearly identified root causes and is (or will be) backed up by rigorous analysis, a model, and testing of all key assumptions. 5. Better cooperation. Satisfying stakeholders, building coalitions, and gaining general support becomes much easier because overcoming change resistance is built into the process. Classic Activism is the paradigm environmentalism uses now. It doesn’t work on the sustainability problem because Classic Activism has no concept of root causes. It thus works only on easy problems, those where intuition alone can find solutions that work. Classic Activism's fatal flaw is it lacks the “Analyze the problem in order to find the root causes” step. The evidence root cause analysis works is overwhelming. Vast swaths of the manufacturing and service sectors of industry have adopted root cause analysis as if their life depended on it—which it does, given the competitive nature of so many markets. Processes like six-sigma, total quality management, Kaizen, and the ISO 9000 family of standards incorporate the concept. Root cause analysis will work on the sustainability problem because it’s worked on millions of other problems and because our preliminary analysis shows the sustainability problem appears to have root causes that can be resolved. In other words the sustainability problem, once analyzed, is not that much different from other problems that have been solved. 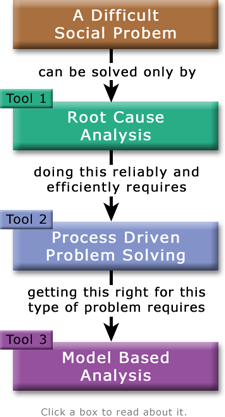 What we’ve done at Thwink.org is adapt the tool of root cause analysis to social problems by wrapping it in the System Improvement Process. Once problem solvers begin using this approach and perfect it they will enjoy the same results industry has long achieved, because all problems arise from their root causes. If your present approach lacks root causes analysis and a process to wrap it in that fits difficult social problems like sustainability, then we can possibly help. Thwink.org is an information rich website. There's plenty to explore here. 1. To get started, study this essay until it clicks. This is the new PARADIGM. It's your new foundation. 2. Then work your way from left to right on the big blue arrow at the top of each page. Grasp what the TOOLS allow you to do and how they do it. Pay special attention to understanding the System Improvement Process. It's the main tool, the one you will use the most. All your work will center around it. Before long you will start modifying it to suit your own particular needs. Your custom problem solving process will then carry you on to wherever you want to go. Nothing is impossible once you have a process that fits the problem. 3. Get the big picture on what the ANALYSIS has found. This contains a number of remarkable surprises, which is to be expected when you dig deep to find the root causes. 4. Finally, review the sample SOLUTIONS. These differ dramatically from popular solutions. Why? Because we are striking at the root instead of hacking at the branches. The folks at Thwink.org wish you the very best of luck on your journey! (1) and (2) Quotes defining the Prescience and Normal Science from class notes by D. K. Heikes, 2011. (3) The “Guided by the paradigm...” quote is from the Wikipedia entry on The Structure of Scientific Revolutions, by Thomas Kuhn, 1962. (4) In the collage of book covers and tools, the lower left image is the tool of the causal chain present in all problems. The lower right image is an Ishikawa diagram in a fishbone shape.